Healing -- where does it take place? In a hospital? At home? In Church? With family or friends? It certainly can happen in many places and in many ways. Each part of the body is important and it is imperative to care for this wonderful temple of the Spirit. But, how do we heal the many parts of ourselves and others? How do we give the same level of importance to all the parts? Too often, we simply brush off our own healing and the healing of others and don’t bother to look deeper. Circumstances this week afforded me the opportunity to get to know two patients and many of the healthcare providers during my hospital stay. Taking the time to listen and take in the goodness of their lives gave me wonderful insight into their faith journey and their healing. What I came to realize is that each of us, as part of the whole human body, is special. What is needed is for us to take time to come to know one another and, if someone is in need of healing, to pause and see if we can help in some way. I learned that I need to reflect on how I help others heal whether it be physically, spiritually, mentally, etc. Or, perhaps I am the one in need of the healing. Do I allow others to help heal me? Will I allow another to minister to me? This week I watched healthcare providers work under difficult circumstances and still they wore a smile and cared for others. They didn’t get to pick and choose whom they would help but they embraced the opportunity to help heal. Am I willing to do the same? That’s a lot to think about as we remember we are many parts but all one body, looking to serve the one true God by living our lives not just for ourselves but for others. 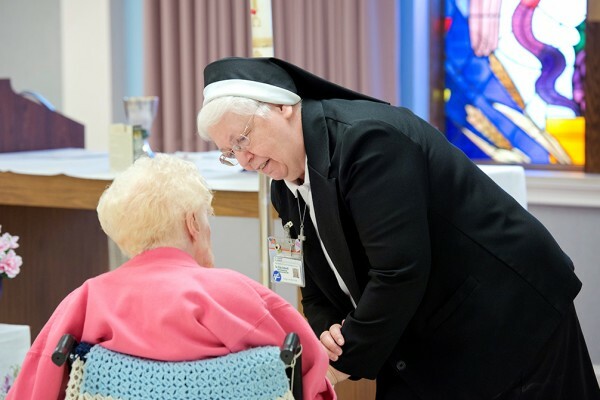 Photo of Sr. Rita Ashwell at St. John Paul II Center in Danbury, CT.